Over the past year, guest blogger John Bloom has been studying Virginia’s regulations governing hydraulic fracturing with horizontal drilling–fracking–and assessing the commonwealth’s readiness to welcome natural gas drilling companies into communities where they have never operated before. With the McAuliffe Administration preparing to address the issue for the first time with new regulations, I asked Bloom to take over the blog this week and tell us how things look. –I.M. Proposed changes to Virginia’s gas drilling regulations are on their way to Virginia Governor Terry McAuliffe for review. If he approves, the revisions will go out for public comment. Public safety and environmental advocates generally welcome the changes, as far as they go. There’s just one problem: the changes fail to address many of the serious risks posed by fracking. The dismal state of Virginia’s regulatory regime has become a pressing issue because, if the fossil fuel industry has its way, unconventional shale gas drilling – fracking — will soon be a part of Virginia’s landscape. The gas industry sees opportunities to drill into the Marcellus Shale in western Virginia and the Taylorsville Basin in Tidewater Virginia, where 80,000 acres are under lease already. Is Virginia ready for this kind of fracking? The fracking industry seems to think so, and Virginia’s Division of Mines, Minerals and Energy (DMME), the agency in charge of regulating gas drilling, seems to think its regulations just need a few tweaks to make fracking safe in Virginia. The health and environmental risks of fracking include a litany of short-term and long-term threats to air, water, land, and human and animal health. The risks come from many directions, including the drilling process, the fracking process, the chemicals used, which typically include potent carcinogens and endocrine disruptors, the handling and disposal of large quantities of toxic wastewater, potential earthquakes, the pipelines and compressor stations needed to transport the gas, and disruption of local communities with lights, noise, heavy truck traffic, and the constant prospect of disastrous explosions and other industrial accidents. For an excellent review of recent findings, check out A Compendium of Scientific, Medical, and Media Findings Demonstrating Risks and Harms of Fracking (Unconventional Gas and Oil Extraction), published by Concerned Health Professionals of New York in December 2014. After carefully studying the risks, Maryland and New York recently declared statewide moratoriums on fracking. Like Allstadt, they found that the risks outweighed the benefits. Other states, such as Pennsylvania, Ohio and West Virginia, have embraced drilling and are learning the hard way that modern fracking – if it’s going to happen at all – requires much more careful regulatory oversight than traditional drilling. Virginia’s regulations start off in an embarrassing place. According to a 2013 survey of shale gas regulations across the country, using two different methodologies, Virginia had the least stringent regulations of all 31 states with actual or potential shale gas production. Given that, and given the rapid pace at which other states are learning from mistakes and tightening regulations, you might expect Virginia to study the potential risks of modern fracking techniques carefully, as Maryland and New York did, before deciding whether to allow them. At the very least, you might expect Virginia to conduct a rigorous review and update of its regulations. Unfortunately, you would be wrong. Instead of a thorough review, Virginia’s DMME conducted a controlled review intended to update only a few aspects of the regulations. A driving force behind the review seemed to be a request by the drilling industry for Virginia to join an industry-endorsed approach to disclosing fracking fluid ingredients while continuing to protect alleged trade secrets. 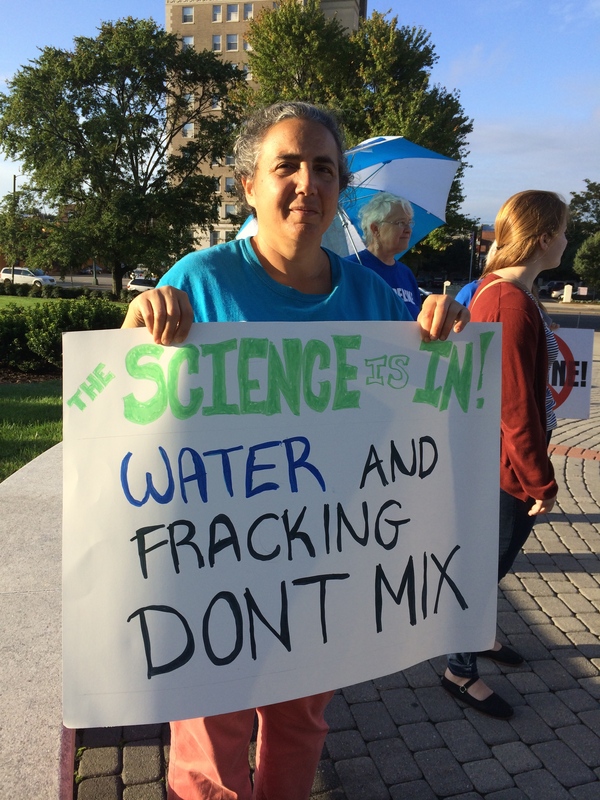 DMME convened a review panel that notably lacked anyone from the Virginia Department of Health (VDH) or anyone else with public health expertise, despite the major public health issues involved in fracking. DMME staff led the panel through a handful of issues. The panel came up with exactly what was intended: piecemeal updates when a broader effort was badly needed. When environmental groups proposed a more thorough regulatory review, they were told their proposals were simply beyond the scope of what DMME would consider. The regulations would continue to allow drilling wastewater to be disposed of by spreading it on roadways, agricultural and forest land. Other states have correctly concluded that this is simply not a safe way to dispose of fracking waste. The regulations would continue to allow the industry to use open pits to store toxic wastewater, while other states such as Pennsylvania now require closed tanks to avoid leaks, spills, and harm to wildlife. The regulations authorize disposing of wastewater at an “offsite facility,” yet water treatment plants in Virginia cannot effectively process fracking waste. This would result in toxins passing through untreated, damaging Virginia’s waterways. How toxic wastewater will be tracked and disposed of needs to be more clearly spelled out and regulated, as it is in other states. In western Virginia, drilling companies would still be allowed to bury drilling muds and cuttings (drilling waste products) at the well-site instead of hauling them offsite for safe disposal. This practice can result in heavy metals, radioactive materials, and other toxins leaching into the groundwater and contaminating soils. That practice is now forbidden in Tidewater Virginia, reflecting a growing double-standard between protections offered to eastern versus western parts of the state. Is western Virginia somehow less worthy of protection? Virginia’s regulations contain no testing requirements or limits on hazardous air pollution and methane emissions from gas drilling operations, despite the recognition of methane as a potent greenhouse gas. Federal regulations may provide a floor in this area, but Virginia should enact higher standards. Virginia regulations contain only a single setback requirement that wells be at least 200 feet from an occupied building – literally a stone’s throw. Other states have developed much more protective siting requirements taking into account floodplains, public water supply watersheds, fisheries, special lands, schools, hospitals and other important considerations. Virginians should have similar protections spelled out in regulations. Correcting these deficiencies, and many other suggestions made by the Sierra Club and other environmental groups, were rejected as beyond the scope of DMME’s review. Direct his Administration to conduct a broad study of the health, environmental, economic and other risks and benefits of unconventional shale fracking in Virginia, so that a considered decision can be made about whether these new forms of fracking should be allowed, and if so, what regulations are needed. Direct DMME to conduct a thorough regulatory review that takes into account the findings of the Administration’s study and the extensive lessons learned from other states. Direct that no permits for unconventional shale drilling be approved until the first two steps have been completed. As long as he takes the steps outlined above, it doesn’t matter much what the Governor does with the weak piecemeal regulatory revisions currently under his review. They could be folded into the broader regulatory review or enacted separately. The important thing is that the Governor isn’t fooled into thinking that these revisions are an adequate response to the threat fracking poses to Virginia’s health, safety and environment. John Bloom, a public interest consultant, is chair of public health issues for the Virginia Chapter of the Sierra Club and serves on the Executive Committee of the Sierra Club’s Mount Vernon Group. As used here, “fracking” and “unconventional drilling” refer to newer forms of high volume hydraulic fracturing, or similar forms of well stimulation using liquid nitrogen or other materials, combined with horizontal drilling. Allstadt was referring to draft regulations in New York, which were much more stringent than Virginia’s. See Brian Neering, Albany Times-Union, April 22, 2014, “Former Mobil Oil exec urges brakes on gas fracking,” available online at http://www.timesunion.com/business/article/Former-Mobil-Oil-exec-urges-brakes-on-gas-fracking-5422292.php. Nathan Richardson et al, The State of State Shale Gas Regulation, at pages 18, 20 (June 2013), available at http://www.rff.org/rff/documents/RFF-Rpt-StateofStateRegs_Report.pdf. Terry McAuliffe, in an interview with Jan Paynter, Host, Politics Matters, September 2011. Available online at https://www.youtube.com/watch?v=EFvDrh92xpM. This entry was posted in natural gas and tagged Department of Mines Minerals and Energy, DMME, fracking, Marcellus shale, McAuliffe, sierra club, Taylorsville Basin, Virginia, Virginia Department of Health. Bookmark the permalink. I am a resident of Washington County in southwestern VA. We have been fighting the introduction of fracking here for over 4 years and would appreciate support. Six surrounding counties have been subjected to first, coal mining, and now gas drilling, in a relentless attack on the environment and community. Last September the Board of Supervisors voted (6-1) to allow natural gas drilling here in spite of a huge public protest and campaign against it. We are now actively seeking to put those officials out of office. I hope that you include Washington County, a beautiful area dependent on agriculture and tourism, in any future regulations to limit gas drilling – and not limit it to Tidewater. Those three steps set a mechanism in place to protect the public, now what will give the average person the capacity and insight to report dangers. My parent’s generation did not blog. Is there simple diagnostic equipment for rangers to source problems?